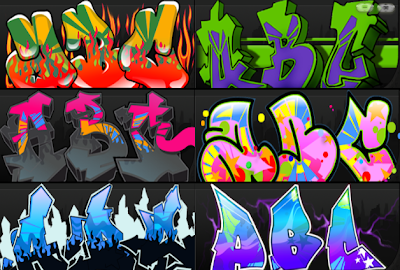 Some examples of graffiti letters designs created online using the graffiti creator. There are several types of patterns or designs that can be made. For example there wildstyle, throwie, bubble, 3D and much more. In addition we can also add effects to give effects that have been provided on the features of online graffiti creator. Easy, beautiful and interesting .... everyone can make a graffiti with style and character to their liking.